Established in 1921, the Rehoboth Beach Patrol is considered one of the Nation’s leading Beach Patrols. With over an 95 year history of excellence in safety, a strong history in lifeguard competition achievements, and a fully operational Emergency Medical Unit, the Rehoboth Beach Patrol is truly leading the way to tomorrow… and beyond. 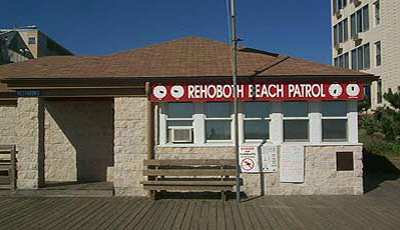 The Rehoboth Beach Patrol is a department of the City of Rehoboth Beach. It operates seasonally from Saturday of Memorial Day Weekend through three weeks following Labor Day. Portable wooden lifeguard stands are positioned throughout the beach based on beach patron population. Two lifeguards are assigned to each stand; some areas that are highly populated have an additional stand staffed by one lifeguard, on a per diem basis. Rehoboth Beach Headquarters is located on the Boardwalk at Baltimore Ave., just north of Rehoboth Ave. The headquarters houses an Emergency Medical Unit and the administrative offices. The Rehoboth Beach Patrol utilizes state of the art GPS digital portable radios that are linked to the beach patrol communications center, located at the headquarters. NO TENTS AND/OR CANOPIES ALLOWED ON THE BEACH DURING THE SUMMER SEASON. Currently, the Rehoboth Beach Patrol is staffed with 55 full-time seasonal lifeguards. Relief lifeguards supplement the full-time staff providing an additional 15-20 lifeguards, all of which are City of Rehoboth Beach employees. Captain Kent Buckson, 2 Chiefs, 4 Lieutenants, and an EMT/Paramedics Technician are assigned to the headquarters.